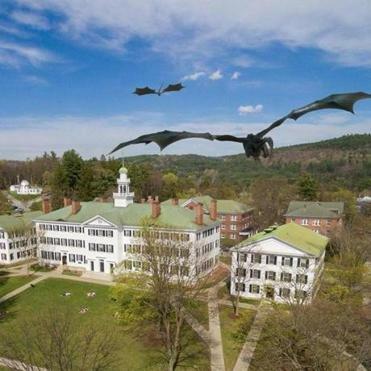 On the quaint, picturesque New England campus, students relax and bathe in the sun on a lush green campus quad — as a pair of dragons soar overhead. The picture looks like something David Benioff, co-creator of the landmark TV series “Game of Thrones,” might have sketched in a notebook during class when he was a student at Dartmouth College. The college’s alumni relations office tweeted the enhanced image Sunday afternoon in a nod to Benioff, who graduated in 1992 and whose hit HBO series launched its highly-anticipated eighth and final season Sunday night. “Should we be worried about this? Or just excited that David Benioff ‘92’s @GameOfThrones is back tonight? #winteriscoming,” the office tweeted. The posting was liked and retweeted by another well-known Dartmouth alumnus, CNN anchor Jake Tapper, who graduated from the Hanover, N.H., school one year before Benioff. The Starks are reunited, but there’s tension in the air with Dany in their midst. In 2017, Tapper interviewed Benioff for Dartmouth’s alumni magazine. Benioff said he worked on another novel for about five or six years in his 20s, but that too went unpublished. “I got rejected by I think every publisher in America, as far as I can tell,” he said. “Yes,” Benioff replied, describing how that story became the inspiration for Benioff writing “The 25th Hour.” That became his first published book and was adapted into a film directed by Spike Lee and starring Edward Norton. Benioff wrote the screenplay for the film and went on to write screenplays for several other Hollywood hits. It’s a far cry from the career Benioff told Tapper he originally planned to pursue: English professor. Instead, Benioff’s work has served as inspiration for other academics. 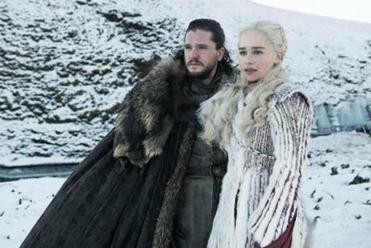 Two Dartmouth professors teach a course there called “Game of Thrones: Re-Imagining Medieval History as an Allegory of the Present.” At least one other professor used the popular series to teach Machiavelli, according to the college’s website. Today, Benioff and fellow producer D.B. Weiss are in unchartered territory with the final season of Game of Thrones. Earlier seasons were based on books by author George R. R. Martin. But because Martin missed several deadlines to finish the series in book form, the TV producers have had to come up with details and storylines for the later seasons and this year’s conclusion largely on their own, working only off descriptions Martin gave them on how he planned to end the books.